Is What You Don't Know Hurting You? We are practically being hit over the head with people telling us that the polyunsaturated fats found in vegetable oils are good for us – great for us even! Well, it's simply not true. In fact, it is the very opposite of true. These oils are suppressing your immune system, aging you beyond your years, and contributing to major health problems. The manufacturers of these oils do not care about you or your health – they care about their profits. And the way they are preparing and marketing these oils shows just that. The more unsaturated the fat, the more easily it oxidizes (turns rancid). Polyunsaturated fats are the most prone to oxidation - then monounsaturated fats, then saturated fats which are the most stable and least affected. (It should be noted that all fats have a combination of the three types.). Oxidation occurs when these oils are exposed to heat, light, and oxygen. 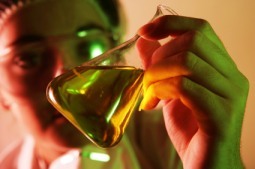 Increased oxidation occurs with increased exposure (even room temperature will degrade oils). The result of all this oxidation is the formation of free radicals, which are key players in the cause and development of disease and aging. Can't I tell if these oils are rancid? Good question, since we can taste or smell other foods to tell if they have gone bad. And this is what bothers me the most about these vegetable oil manufacturers. The rancid smell and taste is disguised by purifying, bleaching, and deodorizing the vegetable oil. They don't call it that though – they call it "refined vegetable oil." You see, most of these oils need to be heated for processing. So they have already gone bad right from the beginning. But then these fats degrade further when they are put in a clear bottle and allowed to sit on a shelf in a brightly lit room at a warm temperature. But the substances that react with the free radicals - which produce the bad smell and taste designed to warn us - have been removed in the refining process. So you buy it and take it home. And open it and use it in cooking and baking. More light, more heat, more oxygen. And so it continues to degrade. You are exposed to more and more free radicals that are completely wreaking havoc on your body. And you have no idea because the refining process masks its rancidity! What to do about polyunsaturated fats? This is the easy part. Follow these tips to improve your health and boost your immune system. Examples of oils that contain lots of polyunsaturated fats are corn oil, sunflower oil, and canola oil. To make sure you are getting the healthful omega-6 fats - eat whole nuts, seeds, and grains. The whole foods have antioxidant protection built right into them. 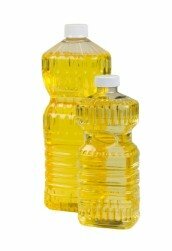 If you must use vegetable oils, buy unrefined vegetable oil that is in a dark bottle and has been kept refrigerated. Always keep your oils in the fridge and tightly capped. Never heat polyunsaturated fats, but it is fine to use them in salad dressing if they are unrefined. For low and medium temperature cooking, use olive oil (a good source of monounsaturated fat). For all types of cooking (including high heat), use good old fashion butter. If that scares you to death, unrefined organic virgin coconut oil is another great choice.